My background was in Economics but when the PNG Chamber of Mines and Petroleum hired me in 2008 as a Project Officer. Over the years as I worked in the Chamber’s Project Office, I began to love the project work and appreciate the how significant it was to an organisation. I was sponsored by the Chamber for project management short courses. I had a personal goal for further studies after graduating with a degree in Economics in 2008 from the University of Papua New Guinea. After learning more about the Australia Awards Scholarship Program, my strategy was to apply for the scholarship after five years of my professional career. 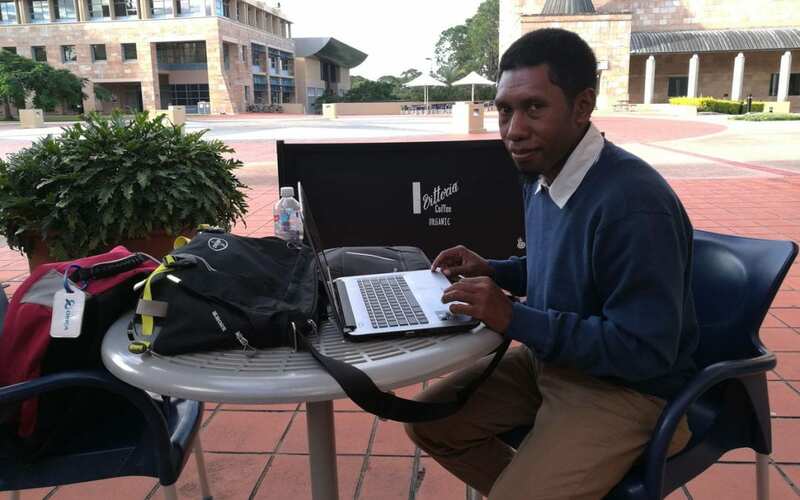 Eventually, after eight and a half years of employment with the PNG Chamber of Mines and Petroleum, I applied for the scholarship and was one of the ninety candidates selected. I am is studying for a Master of Business Administration and Master of Project Management at Bond University, Gold Coast, Queensland. I was a key member of the PNG Chamber of Mines and Petroleum project team. In that role, I learned fiscal and regulatory policy and legislative issues are some of the key challenges facing the mining industry. The Chamber has been working with the relevant government agencies in the Mining Act review to ensure that the industry is conducive for investment for all stakeholders. Working towards an attractive policy and legislation will be the primary goal. Landowner benefits is another issue that has been ongoing leading to project disruptions over the years. Landowners are a vital stakeholder in any mining project. Consulting them and identifying the right landowners and ensuring the benefits given to them and also the impacted communities is critical. I will do whatever I do in capacity either with the Chamber or another organisation to promote that and to achieve them. The important messages that I aim to drive through my job are the sustainability, and the competitiveness of the PNG mining and petroleum sectors and secondly is fairness and equality in benefits distribution of the mineral wealth. The country’s Vision 2050, the PNG’s Development Strategic Plan (2010 – 2030) and the UN SDG have set a platform for the nation to achieve through job creation and economic growth over the years. The mineral sector is expected to generate growth with several mining and LNG projects in the pipeline (2018 ANZ Report). Either working with the Chamber or another mining organisation, I see myself contributing towards the goals and strategies stipulated in the vision, the development strategies and goals. Working with the organisation and the government in maintaining the fiscal and regulatory framework of the mining and petroleum sectors are vital in ensuring a stable, conducive and attractive environment for investment in PNG’s resource sectors. Providing a stable system/framework towards achieving the development goals is one of my primary goal in whatever capacity I take upon my return. The PNG Chamber of Mines and Petroleum could not guarantee me a position on my return, so I had to resign. But that does not rule them out; I’ll be knocking on their door when I complete my studies. If there is an opportunity, I’ll be happy to rejoin the project team.